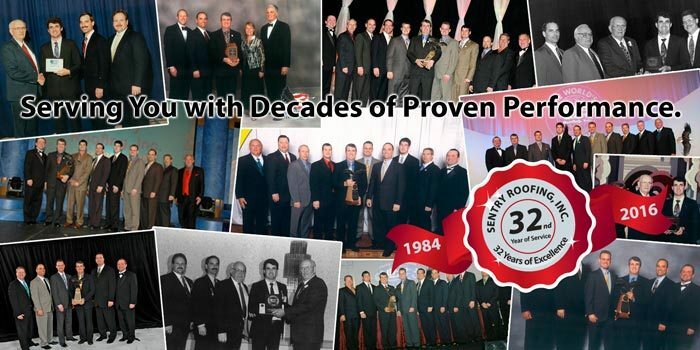 About Our Company | History, Mission & Vision | Sentry Roofing, Inc. 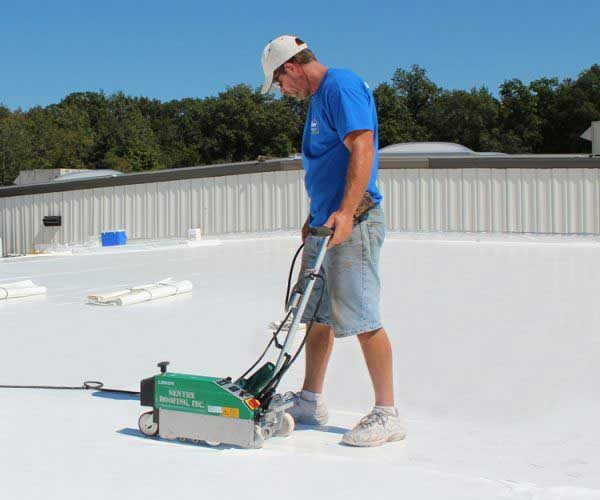 Since 1984, Sentry Roofing has been successfully installing commercial roofing solutions for facility building managers and commercial building owners across the country. Sentry has successfully completed roofing installations in 41 states for a broad variety of clients. We pride ourselves on exceeding our customer’s expectations by delivering the highest quality of workmanship and customer service on every repair and every installation. Year after year, nearly 75% of our sales volume is from repeat customers or by direct referral from satisfied clients. We experience this kind of loyalty by working with honesty and integrity in all that we do. We never oversell something you don’t need for our benefit. We work with you to prioritize existing roof conditions and your operational needs for a complete project or to prepare a multi-year budget that will allow completion over the course of time, extending the plan to meet your budgeting needs. 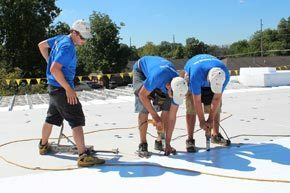 From our highly detailed evaluations to our dedicated customer service team, you will always know what to expect each day as the installation of your commercial roof progresses. You can focus on your business and not worry about whether your roofing project will be done right and on time. 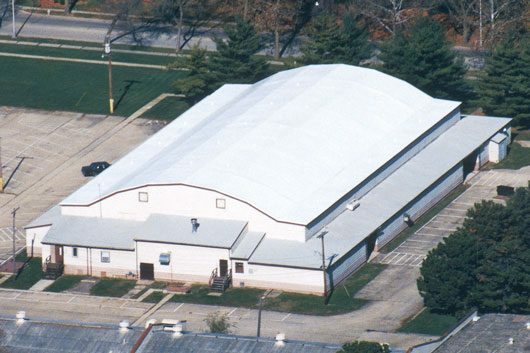 Whether you need service for a flat, metal or low-sloped roof, we’re prepared to evaluate, document and help you determine the best choice for your business and your unique facility. In addition to being respectful of your business operations, we will operate safely at all times and promptly adapt our standards to any additional safety protocols you may require. We will conduct a pre-construction conference to confirm all project details, requirements for communication with your team and any safety standards unique to your company. Each day, jobsite inspections and safety checks are conducted to ensure safety requirements are being met. The result of an aggressive approach to safety avoids injuries and near misses, saves money with reduced insurance rates, and promotes confidence and efficiency in the work force. Proper behavior by our crews on your job site results in peace of mind for you. We treat every project like it is the most important job we’ve ever done and expect to exceed your expectations with every detail, no matter how small. We believe there is a way to do a job and then there is our way – the Sentry way! We market our services in Indiana and Illinois and are licensed to work and complete installations anywhere east of the Rocky Mountains for established clients owning multiple facilities. Sentry Roofing, Inc. has commercial roof installations and satisfied clients in over 41 states. 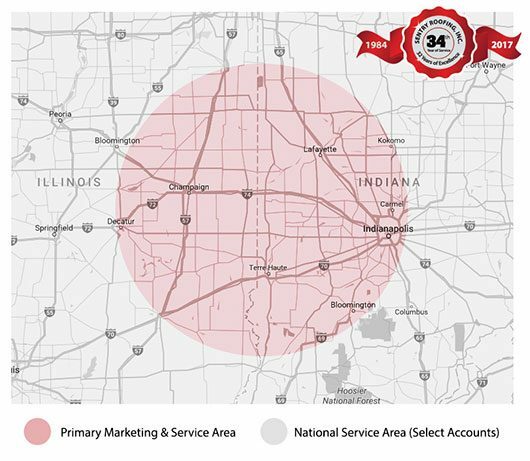 Some popular locations we service include Danville, Champaign, Urbana, Decatur, Lafayette, Terre Haute, Taylorville, and Indianapolis.